This fragment showed up in my yard last fall. Remember how Hansel left white pebbles to mark the trail home? 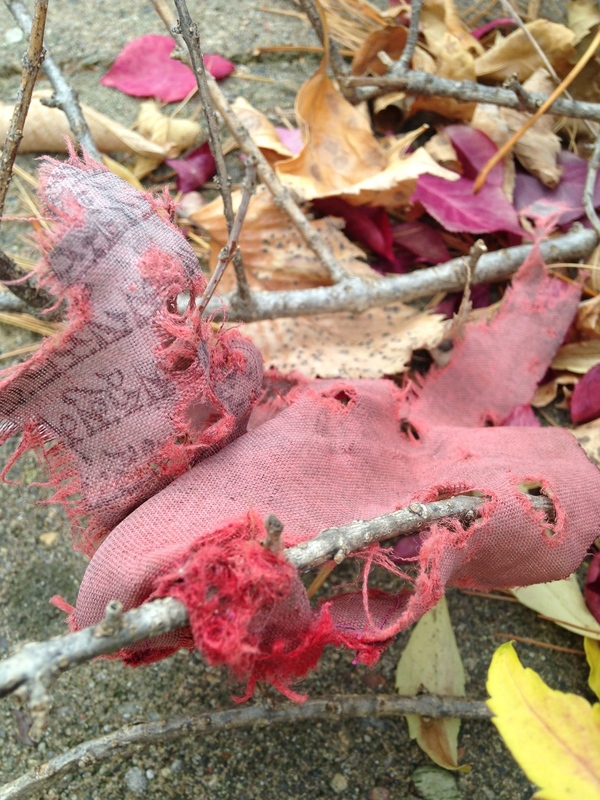 These shredded pieces of fabric mark the presence of a person, and a snippet of their story. Its only a piece, torn from the rest of the narrative, and so the person discovering it will create text to complete the story. And so it is a both a text and a fragment. Lately I've noticed discarded clothing, in bags or strewn next to a path, and cannot help but wonder if they are put there to mark that a person was there. Although they seem abandoned, could these be messages that alert passers by who know the code to welcome or warning? Like the Hobo Codes left on fence posts and telephone poles during the Great Depression, these may signify where to find a like-minded explorer, who rules this territory, or offer a glimpse of the neighborhood culture. Or maybe they are free-will offerings for the next traveler, when not useful to their owner any longer. Regardless of the intention, when these show up in your yard, or on your path to work or school, pay attention, they may be telling you something.